WHERE ARCADE GAMES GO TO DIE With not much on my plate yesterday I made the short trek out to Crabtown to see what it was all about. I figured if it was listed on the internet on a website devoted to classic arcade gamerooms and was ranked high on the most games list... I should check it out. Especially if Mapquest said it was just 9 miles away. I clicked on "map the scenic route" because it was going to take us to the heart of Glen Burnie, MD and all routes in Glen Burnie are scenic routes. As my buddy Ben said on our drive out, "If you're every feeling down about yourself, go to the Wal-Mart in Glen Burnie." 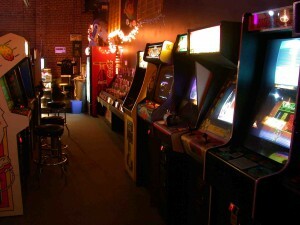 Growing up in a gameroom in Tampa I have missed the days of sweaty palms full of quarters and the sounds of dozens of games all blaring the sounds from the high scores screen. I look for classic games when i travel and have seen a few here and there but the idea of an old gameroom full intrigued me. The posts on the website didn't say much but did mention some games not working and others barely clinging on. I assumed this wasn't gonna be a home to old games kept for the history and stories. After reading the posts about Crabtown, I had a pretty good idea what to expect and to be excited about the games but not so excited about their condition or the condition of the place. One post elaborated, "it's a real down and dirty Anne Arundel County atmosphere---lots of big guts and the trucker/waterman look reigns supreme..." We walked in the front door of the diner and made our way past the 'salad bar' and keno machines to the back room where the games were. Crabtown is a diner, gameroom and liqour store in one. I assumed at seeing us, the locals figured we were another couple of dudes who heard about this place from "that internet". There are several change machines advertising in handwriting "No carry-out quarters". Apparently this was a problem at one point... enough to merrit a sign. I told Ben we needed to make sure we used all our quarters! Now, the first thing you will notice is the smell. This, of course, after the "Wow! Look at all the games!" Crabtown is poorly ventilated and very smokey. While this is probably how the gamerooms where growing up, smokey rooms are just something you don't see much of anymore. Especially during the day. We actually left earlier that I would have liked because our eyes began to burn and I was sure we were out of laundry soap at home. We went right for the Super Sprint game and quickly learned that we should be cautious which machines we fed quarters to because not all worked. This was the case as just player two worked while the other ate quarters. I quickly fell back into my old gameroom routine. When it didn't take the first quarter I put another in. "Damnit!" We then made our way around the circuit and hit up all the classics; Gorf, Missle Command, Punch-out, Kung-fu and Battlezone to name a few or the hundred or so inside. We ran from game to game feeding them money ensuring that we wouldn't leave with any carry-out quarters. When a little kid came us challenging us to a game of Demolition Derby we had to take him up on it. I hoped he'd ask for a quarter which I would have gladly given him feeling it was my obligation to all the strangers I bummed off of as a kid. For a second I saw myself in him as he lit up when the game chimmed and we selected our color. I again saw myself when he told me how to play and which cars were good and which weren't. Unfortunatly, I also saw my childhood when the game was over and he followed us from game to game wanting another challenge or playing a game on his own and pleading for us to come watch. I was reminded of trying to get my step-dad (a civilwar nut) to play me in Atari's Combat by telling him it was called "civilwar". He called me on my lie when he schooled me in history telling me neither side had much of an airforce in the 1800's. Ben and I played for 30 minutes or so until our eyes couldn't take it anymore. Again, not from the glare of the games or the eye stain from the old screens but from the smoke. The game selection at Crabtown is great! It's an awesome glimpse into the past but an unfortnate home for the history each game has. As they age I am sure they are worked on but more from the inside out as the games seem to work just don't look all the spectacular. But for nostalgia, this is the place to go. Again from the internet post, "Not only is it alive and well, the PLACEMENT OF THE MACHINES hasn't even changed in aprox. 20 years I've been going there."